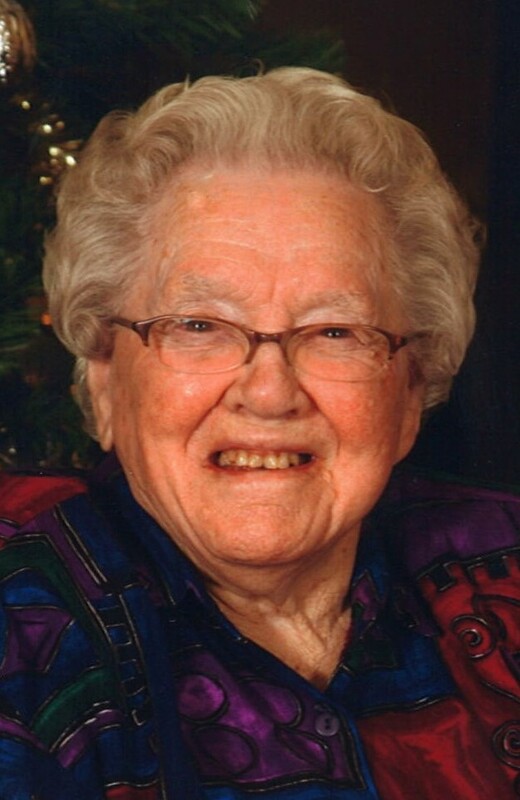 MALTA-Vivian F. McMullen died on February 8, 2018 at the Hi-Line Retirement Center at the age of 100. Visitation will be 7:00 P.M., Thursday, February 15, 2018 at the Kirkwood Memorial Chapel. Funeral Services will be 11:00 A.M., Friday, February 16, at the Kirkwood Memorial Chapel. Condolences for the family may be left at www.kirkwoodfunerlahome.com. She was born April 12, 1917 in Coal Harbor, North Dakota. At the age of six months, she came with her mother and siblings to a homestead on Whitewater Creek in northern Phillips County. She attended the Victory School through 8th grade. In 1934, she married Leonard McMullen. They had seven children. Vivian was a hard worker. She milked between five and seven cows each day. Because Leonard worked off the farm a lot she learned to do most farm chores and she tended three gardens each summer, She raised pigs, chickens, ducks, turkeys and geese and butchered them for meat. She made her own lye soap and filled the cellar with canned food. She liked to feed people and nothing tickled her more than playing a joke on someone. When her kids started school in Whitewater, she got a license to drive the school bus. She got a first aid card and took a typing class in adult education. She made her own patterns, sewed for her kids and made many colorful scrap quilts. After they moved to Malta, she did housekeeping, worked at the retirement home and the hospital. After the death of her husband, she moved to Washington State with her youngest son. She worked at Spokane Health Care for many years. Since 2013, she resided at the hi-Line Retirement Center in Malta, except for a brief stay at the Care Center in Havre. She is survived by six of her seven children: Ray McMullen, Wilma Mavencamp, Barbara Mavencamp, Pat Omdahl, Mike (Meriam) McMullen, and Terry McMullen, daughter-in-law, Bonnie McMullen, sister-in-law, Erma Hellie, twenty three grandchildren, thirty five great grandchildren, numerous great, great grandchildren and many nieces and nephews. She was preceded in death by her mother and stepfather, Hank and Nora Brown, her husband, Leonard McMullen, and one son Robin McMullen, brothers, Andrew (Helen), Roy (Mary Ellen, Alf, Art and Barney (Anna Marie), Ike (Stella) and Earl Hellie, sisters, Hilda (Al) Brown and Ann (Dave) Omdahl, daughter-in-law, Arabelle, sons-in-law, Bud Mavencamp, Morris Mavencamp and Derold Omdahl. Our condolences to your families. May she Rest In Peace. You have earned your peace, now let God serve you in this time of rest. God bless your family. I have fond memories as a little girl of going to the farm and seeing Aunty Bim managing the farm. She the last of the Hellie generation. May she Rest In Peace. Vivian would come to the Red Hatters coffees at HLRC and say she just wanted to listen to everyone. God Bless her on the new chapter she is embarking on. Knowing your Mother thru her sitting close to me at the Red Hat bi-monthly coffees has been such a blessing. Reading her obituary telling of all her accomplishments enforced my admiration for her. May all your memories of her 100 years on this earth bring you peace..